The concept of Marine Protected Area (MPA) in the Philippines dates back in the latter part of the 90s to the early part of year 2000 as a strategy towards coastal resource management. There have been plenty of MPAs created all over the Philippines, but only very few exist at present times despite efforts for its sustainability both in the national and local levels. In an attempt to gather yardsticks about MPA management I joined a group of coastal stakeholders in Sta. Cruz in their visit to the town of Lanuza in Surigao del Sur on December 7. Lanuza is best remembered by its exemplary performance of administering a huge MPA. “It was just a matter of setting in place a comprehensive framework in order for the people on the ground to appreciate the initiative,” said Dante Limpot, former chairperson of the Peoples Organization (PO) that handled the inclusive command of the MPA before he was later absorbed as organic personnel of the Coastal Resource Management office. He stressed that the first few years of MPA management is crucial especially in the aspect of social preparation where local fisher folks mostly showed vehement resistance. “It is imperative that there is livelihood option to be offered to the community if MPA management is to be considered seriously,” Limpot added, stating that the assistance provided by government offices like DOLE, DTI and LGU had helped a lot in their quest to succeed in managing a 111 hectares MPA. Presently their PO enjoys 6-digit total assets in a variety of business enterprises operated smoothly. The efforts exerted by Lanuza to make its bay what it is now has never gone unnoticed. In fact, they are a consistent regional winner of the prestigious Para El Mar Awards, something that boosted the present multi-stakeholdership approach of the town in terms of coastal resource development and management. The MPA management mechanism employed by Lanuza, which is basically community-based, is a clear manifestation that environmental conservation and protection should stem out through people empowerment. Other thwarted MPAs in the country, as far as I have seen, are mostly caused by inappropriate approaches introduced by local governments, or are fatalities of the traditional practices flavoured by the ever-detrimental political factor. The birding session on December 22 at the Philippine Eagle Center (PEC) in Malagos might be the last session for 2018 but definitely a good one. A total of 30 species showed up but some common birds were nowhere in sight. On a lighter note the session was sort of a reunion for me with some Davao birders Tonton (the organizer), Alden, Eric and John Paul. We arrived at the parking area of PEC by 6:45 AM and we were greeted with a Brahminy Kite in a durian tree from afar, a usual perching site for this raptor which was in company with the disturbing Large-billed Crows. The Rufuos-crowned Bee-eaters were in a habitual site scouting for bees in a bald tree near the car park while four Guiaberos were caught passing by in the same site. We headed to the lagoon part of PEC and seconds after our arrival a lone Brown-breasted Kingfisher flew just once and never showed up again. As we head further northeast we saw one Coppersmith Barbet. 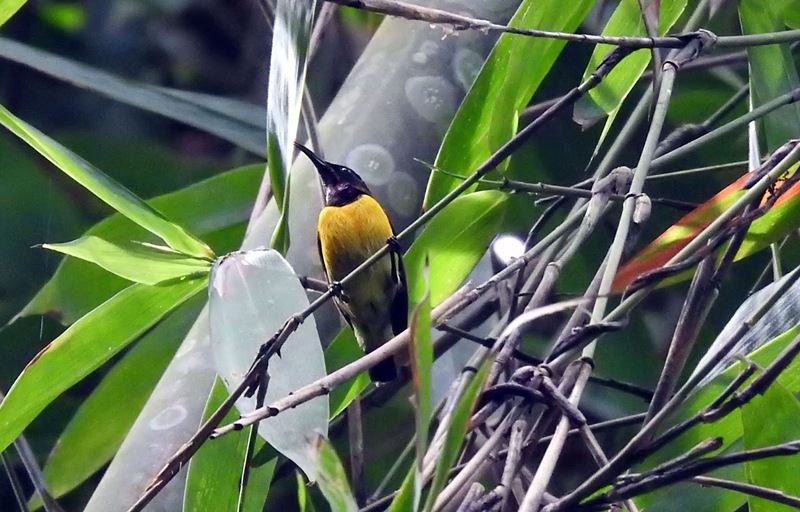 Philippine Bulbul and Yellow-wattled Bulbul were also great consolations. The second leg of San Miguel Flavored Beer (SMFB) tour was held in Davao City on December 16, 2018. A total of twenty five (25) selected sari-sari stores around Poblacion area particularly in Barrio Obrero were recipients to a visit of SMFB brand ambassadors led by actress Yassi Pressman and her tag team Fro Bro and Geek Guy. The event was also held in Baguio City where Pressman and her gang sans the parrot also visited 25 stores and gave the outlet owners coolers and other SMFB #sweeeet goodies. The project is SMFB’s early Christmas treat to consumers and retailers for continuously patronizing the country’s first commercially sold flavored beers carrying two variants in Apple and Lemon flavors. The 7-Eleven Run will be in Davao City for two consecutive seasons next year as it will be staged on February 3, 2019 simultaneous with two separate locations in Luzon and Visayas. Organizers said it will be a more exciting footrace for both professional and recreational runners given with the plenty of freebies and cash prizes. The race was first held simultaneously in 3 venues across the country this year, with over 25,000 runners participating. The 2019 version promises to be even bigger, better and more exciting. New race categories will be introduced next year. At stake also is the opportunity to compete to an international Asian marathon and to win a 500,000 cash prize. The race in Luzon will be held in Filinvest City, Alabang. The Visayas leg will be held at Cebu Business Park and the Mindanao leg will be in SM City Davao. 7-Eleven will be introducing the 32K category next year. Runners also have an options to take a short 500-meter run for kids in Manila and Cebu, a 10K buddy category up to a 42K full marathon. Davao leg will have the same categories except the 500-meter kiddie run. The complete list of categories in Davao are as the following: 3K, 5K, 5K Buddy, 10K, 10K Buddy, 16K, 21K, 32K and 42K. As always, 7-Eleven continues to support Filipino athletes. The overall top 3 Filipino winners for 21K, 32K and 42K will be awarded cash prizes and medals, plus a chance to join an international marathon in Asia with an all-expense paid trip. The 2018 winners of the 21K and 42K races were sent to Jeju, South Korea, competing the 23rd Jeju International Tourism Marathon Festival where they dominated the top spots in their respective race categories. To further encourage the spirit of competition, 7-Eleven will be giving away bonus cas prize to the top Filipino athlete who can beat the Philippine record for 42K category. The record setter will take home 500,000 pesos in cash. Registration is now open and will be up until January 15, 2019 only. Customers can also redeem free race kits from the CLiQQ Rewards Catalog when theyu buy participating items from sponsors. Run 2019 e-stamps can be earned when customers buy participating items worth 100 pesos and have their CLiQQ app bar code scanned. To redeem free race kits, customers must earn 8 e-stamps for non-buddy categories and 16 e-stamps for buddy categories. Promo runs from November 21-January 1, 2019. 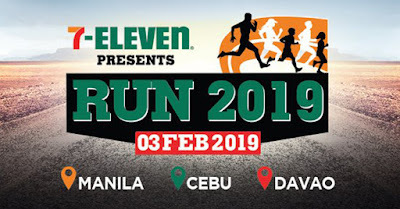 7-Eleven Run 2019 is co-presented with Filinvest Alabang, Cebu Business Park, SM City Davao, exclusive sportswear partner, Asics and official timer Soleus and L Timestudio. The event is also supported by Selecta, Cornetto, Nature’s Spring, Summit, Gatorade, Del Monte, Pocari Sweat, Refresh, Kopiko78, San Miguel Beer, Fit ‘n Right, Aquafina, Pepsi, Nova, Evian, Le Minerale, Sip, Safeguard, C2, Mogu Mugo and Magnolia. Official media partners are ESPN 5, Smart, PLDT and Cignal. The Britannia group of islands in San Agustin, Surigao del Sur is a promising beach site for minimalists and naturalists, that is why I find it fitting to what I heed for in a destination. In our 3-day bench marking tour in Surigao on December 5-7 we were exposed to at least three islands in Britannia and we did just that, we were really impressed with nature’s offering – pristine islands, nothing else could be more appropriate in describing the place, it is really pristine and literally beautiful. The many islets scattered throughout the bay of San Agustin look like green marbles that enhance the beauty of the ocean fronting the pacific. And then a stopover in Hagonoy islet is perfect to have a glimpse of the bay in 360 degrees perspective. We took our breakfast in Hagonoy islet but I vehemently refused the ration for a while so that I could enjoy the finest white sand I have ever seen. This is by far a great item in terms of natural island tourism, no exaggeration whatsoever. Opposite Hagonoy Islet is another virgin site, locals call it Naked Islet. Another stopover was the more deafening Boslon Island. In here, there is a touch of commercialism because ocean rides are being introduced by the community. At a reasonable price one can do jetski ride, banana boating, mixer riding and other related activities. Souvenir items can also be bought in Boslon Island. The last part of the tour had us spending short time in an islet opposite Boslon. Here, the landscape is much greener with coconut trees grown all over. Some driftwood here enabled me to manufacture some good shots, even postcard shots at that. Britannia island is another jewel that Mindanao is truly proud of. For accommodation requirement in San Agustin, I highly recommend Oasis Rest House as having affordable and good foods. They also cater island hopping tours. I had a great trailblazing last November 14 along with some fellow adrenalin junkies in my hometown Jojo Ibañez, Rjay Estabaya and Froilan Miagao. Our destination was the series of gorgeous waterfalls situated in Mailum River and is exactly nestled in sitio Kibasanga, a western tip of Barangay Coronon leading to forested portions of sitio Binuangon, southern portion of Mt. Barira and Mt. Loay and northern part of Tubison where the towering Mt. Leong can be seen. There are approximately 8 waterfalls along the river, all of them good reasons of a stopover for bathing and cooling. The waters are really cold and pristine because the entire surrounding of the river is covered with green sceneries. For those who are familiar with the Kiblan waterfalls, the Mailum waterfalls series are at the upper base. 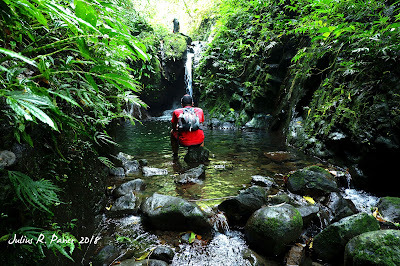 River trekking accounts for more or less 2 kilometers of the whole trek which starts at the Kiblan hanging bridge. Upon reaching sitio Kibarangan I met our former Upland Development Programme (UDP) sitio leader Nong Sulpicio Dulay in his farm house. It was a quick sort of a reunion for me and Nong Sulpicio whom I considered as one of the few good leaders during my stint with UDP. It was quite difficult trekking Mailum river because the rocks are very slippery. Some face-the-walls with minor cliffs are detour routes to avoid deep river portions. The waterfalls are good reliefs, though, especially since it all just situated in adjacent intervals. The tallest was the last waterfalls we reached, approximately measured 15 feet. Much as we wanted to trek further but the vegetation covering the upstream river part made the trail very hard and almost impassable. After a short lunch we stayed for 30 minutes and dip into a pool in one of the waterfalls. This one we thought of as the most ideal site for bathing. Our descent was a bit faster but we had our last dipping in a pool located just before approaching the Kibarangan foot trail. Numerous wildlife species were present in Kibasanga such as Pulchrana grandocula, a common amphibian in Mindanao. Assorted dragonflies and butterflies made Mailum river their sanctuary. I also saw and heard plenty of birds in the site. 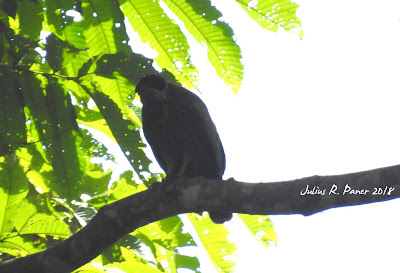 A serpent eagle was caught perching in a huge tree from afar and another one gliding. 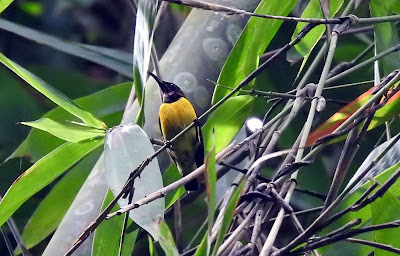 The Rufuos-lored Kingfisher also flew once and another lifer was the alluring Purple-throated Sunbird. For those who are planning to visit Mailum waterfalls, I would like to remind you that the place belongs to an ancestral domain of the Bagobo-Tagabawa under Certificate of Ancestral Domain Title No. R-11 SCR-1005-034, hence, visiting the place needs consent from the tribal leader of Coronon. For as long as there is no standard policy yet in going to the area it is always better to seek go-signal from them for information purposes.